What if Beer Companies Told the Truth? Would some of their labels say, “Brewed with pure Rocky Mountain spring water, GMO corn syrup, and fish bladder”? You’re unlikely to see any of these industrial-sounding ingredients on a label, because listing ingredients in beer is voluntary. And when ingredients are listed, it may be a partial list—which is even more deceptive than having no list at all. 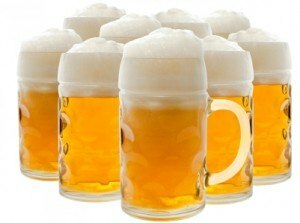 Several beers, for example, contain HFCS, most of which is genetically modified (GMO), and isinglass, a clarifying agent made from the swim bladder of fish . But check most beer websites and they’ll tell you their “key ingredients” are “roasted, malted barley, hops, yeast, and water.” Perhaps the HFCS and isinglass were not “key” enough to merit inclusion on this list? Newcastle uses artificial caramel color to simulate the golden brown color that is supposed to come from toasted barley. “Caramel color” sounds innocuous, right? But it’s manufactured by heating ammonia and sulfites under high pressure, which may create carcinogenic compounds. Miller Light, Coors, Corona, Fosters, Pabst, and Red Stripe use corn syrup, and Molson-Coors acknowledged that some of their corn is GMO. Budweiser, Bud Light, Bush Light, and Michelob Ultra use dextrose (made from corn). The labeling regulations are confusing and capricious. Food is regulated by the FDA, and requires a Nutrition Facts panel, but alcohol is regulated by the US Treasury Department’s Alcohol and Tobacco Tax and Trade Bureau (TTB). Unless it’s beer made with something other than malted barley, and then it’s regulated by the FDA and must carry a Nutrition Facts panel. States also have their own regulations, which can supersede those of TTB, but not of the FDA. Marion Nestle, a nutrition professor at New York University, explained on her blog  why we still don’t know the ingredients in alcoholic beverages. In short, TTB has been procrastinating since 2007 on completing their rules for labeling of alcoholic beverages. People with allergies to genetically modified corn are taking a chance when drinking beer, as there is no requirement that GMO ingredients be identified on the label. We told you early this year about the dangers of GMOs , and in 2011 about the dangers of sugar , especially fructose. So genetically modified fructose carries a one–two punch, and may be one of the more toxic foods that can be hiding in your food or drink—with nothing about it on the label. Unfortunately for those with a sweet tooth, eschewing HFCS for plain old cane sugar may not be that much of an improvement. A recent study of mice fed a mixture of fructose and glucose showed that even moderate amounts of sugar shorten life span  (females fed sugar died twice as fast) and hamper reproduction (males were less likely to hold territory and sired fewer offspring). While it certainly has its health benefits, and studies suggest that people who drink a little live a bit longer, alcohol—even without unsavory additives—has  more negatives than plusses. It introduces what is treated as a poison by your body and stresses the entire gastrointestinal system, from mouth to colon, making cancer possibly more likely, especially in the esophagus. It may increase the risk of heart disease, high blood pressure, and cirrhosis of the liver. Not ready to give up the occasional brewski? According to the Food Babe , Sierra Nevada, Heineken, and Amstel Light are good choices, as they use only non-GMO grains and no artificial ingredients, stabilizers, or preservatives. German beers are subject to the “Reinheitsgebot” law mandating that beer be produced using only water, hops, yeast, malted barley, or wheat—you won’t have to guess what’s in them. An obvious choice is certified organic beer, which cannot include GMOs and other harmful additives by law. And then there are the microbreweries. Many craft beer companies will give you a complete list of ingredients if you ask. Be warned, however: large beer companies are buying up microbreweries one by one, as Molson-Coors did with Blue Moon and Anheuser-Busch did with Goose Island Brewery. The healthiest of all alcoholic beverages is not beer at all, but red wine. It naturally contains resveratrol , which appears to have anti-aging, cancer-preventing, cardio-protective, neuro-protective, and anti-diabetic effects. It’s also an anti-inflammatory and an antiviral to boot. As we noted in a recent article , red wine can also help clear bad bugs from your stomach. Cheers!